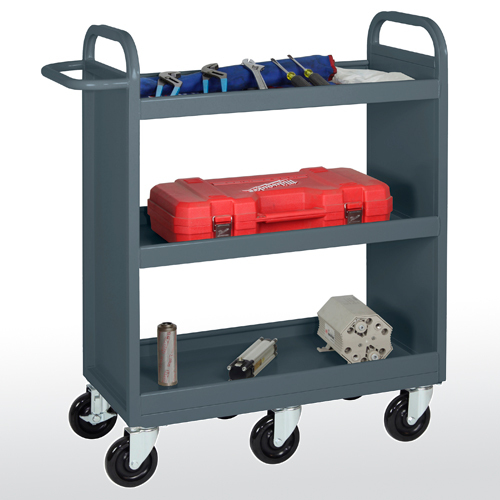 These Endurance Line Book/Utility Trucks are made of 18-gauge welded steel construction for heavy duty use. Shelves hold up to 200 lbs each. Ships fully assembled ready to use. Strong, 18-gauge welded steel construction with durable powder coat finish. Six heavy duty 5" swivel casters (2 locking) for strength and effortless maneuverability. Extended handle for easy steering, even when fully loaded. Double-sided shelves for twice the storage capacity. The slope shelves keep items from falling off during transit and hold up to 200 lbs. Each shelf side measures 30"L x 6-1/2"W x 5-1/2"H. Distance between shelves is 12". Ideal for binders, books and supplies. Strong, 18-gauge welded steel construction with durable powder coat finish. Six heavy duty 5" swivel casters (2 locking) for strength and effortless maneuverability. Extended handle for easy steering, even when fully loaded. Single-sided shelves with dividers ideal for keeping items sorted and organized. Includes 6 steel dividers. The slope shelves keep items from falling off during transit and hold up to 200 lbs. Shelf measures 30"L x 13-1/4"W x 9-1/4"H. Distance between shelves is 12". 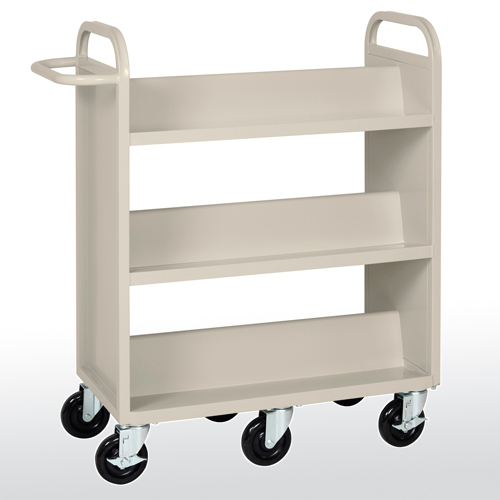 Ideal for transporting binders, books, office/shop supplies, mail, parts/tools. Strong, 18-gauge welded steel construction with durable powder coat finish. Six heavy duty 5" swivel casters (2 locking) for strength and effortless maneuverability. Extended handle for easy steering, even when fully loaded. Tray-style shelves with 2" lip keeps items from rolling off during transit. Each shelf hold up to 200 lbs. and measures 30"L x 16"W x 2"H. Distance between shelves is 12". Ideal for a number of applications requiring transporting of heavy items such as automotive tools and parts/supplies, office equipment and supplies. 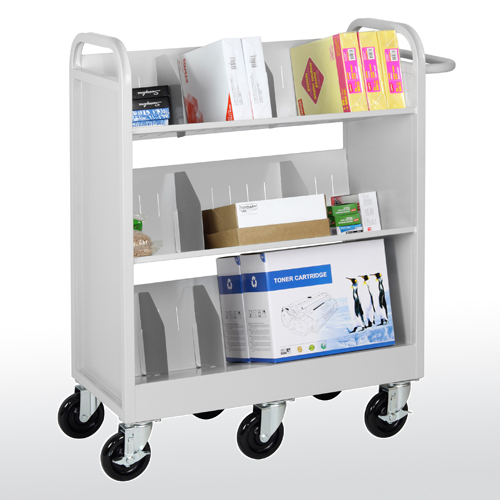 To compare several categories within Bookcases & Booktrucks, click on View All Bookcases & Booktrucks.